After his baby son had an arm amputated, captivating speaker & former psychology teacher Ben Ryan became a self-taught engineer in order to develop prosthetic limbs for very young children. The strength of love, the power of human ingenuity. Very few of us can imagine our emotions, let alone think about the practical challenges ahead, if our 10-day-old baby had to have an arm amputated. This is the tragedy that happened to Sol Ryan. Yet not even a fortnight into his first-born son’s life, Sol’s father and former psychology teacher, Ben Ryan, determined that no obstacle would stand in the way of his child living a full and active life. More, he had a vision that many other children would benefit from the best innovations that science and technology could achieve. Ben set out on the road to becoming a self-taught design engineer. He made Job One the development of an idea for replacement limbs, prosthetics, that was inspired by nature. Spiders use fluid pressure to make their limbs move. Ben believed the same principles could be applied to the movement of prosthetics for human beings. And in 2016 he set up a company called Ambionics with a clear goal: to turn his ideas into working reality. Ambionics has since gone from strength to strength. Using knowledge from his own training as a neuro-psychology lecturer, and collaborating with engineers, bio-technologists and specialist designers, Ben has led Ambionics to develop major advances in prosthetics technology. 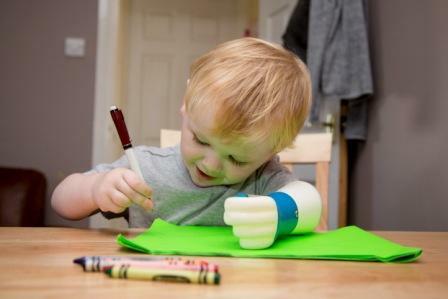 Ben knew that it is crucial to give very young children the chance to interact with prosthetics as quickly as possible. This way, their brains can learn to register, react to and fully use their replacement limbs. The vital developmental window is narrow. To maximise its potential, the right technology needs to be available much earlier in a child’s life than existing approaches could accommodate. Right technology, right time, is of the essence. In just two years of the company’s existence, Ben has proudly accepted two national (USA and UK) and five international awards for technology and innovation achievement. His work has been peer reviewed by medical experts through Orthopaedics Research UK. And he has been privileged to work alongside world leaders in technology, design and engineering, including teams at Microsoft, Autodesk and RS Components. Ben continues to challenge current practice around the technologies and the treatment timings applied to babies and toddlers who are missing a hand. For very good reasons – greater functionality, much improved outcomes and better lives – he wants to disrupt the status quo. His vision, of free-to-all facilities offered around the world, is starting to be realised. In 2018, the first, entirely free, specialist Ambionics prosthetic limb clinic will open their doors in South America. Ben and those who work with him are passionate about the difference to lives these facilities can make. Ambionics is still a pre-revenue start-up however. All funding comes from corporate sponsorship, donations from the public and Ben’s paid public speaking engagements. To help move this vital work forward and fund innovations that will change lives, Ben actively seeks more paid speaking opportunities. Told simply, passionately and from the heart, the story of Sol, Ben, their family and their extended and ever-growing worldwide network of supporters, experts, innovators and technologists is as moving as it is inspirational. This is a narrative of human compassion, determination, endurance, curiosity, innovation and yes fun, in the face of even the toughest circumstances. Once heard, it is never forgotten. Ben has a proven track record for inspiring standing ovations and has the ability to captivate audiences for sessions running from 30 to 90 minutes. Please complete the following form to enquire about booking Ben Ryan.